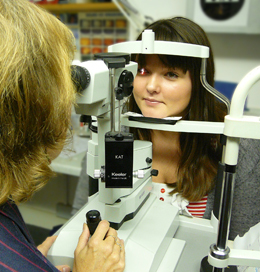 As everyone’s eyesight is different, we tailor the eye examination to your individual circumstances. 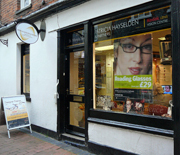 We understand that your eyesight is precious so we take your eyecare seriously. Your eye examination will probably commence with History and Symptoms – a question and answer session, so that the optometrist can get to know about you and your eyes. This will include the main reasons for requesting the appointment, any past eye history for both yourself and your blood-relatives (eye conditions are often hereditary) and discussing your general health and medications (some eye conditions are health related). The optometrist will want to check any spectacles that you wear, so always bring these to your appointment. The optometrist will also want to know about your work and lifestyle, to get a clear understanding of your visual requirements. Refraction – This part of the examination usually starts with the optometrist making an objective assessment of the focussing of your eyes, using a retinoscope and corrective lenses, to determine whether you are long-sighted (hypermetropic), short-sighted (myopic) and/or have astigmatism (where the eye has more than one point of focus, due to it being non-spherical). This retinoscopy procedure provides enough information to prescribe specs (if necessary) for small children or people with communication difficulties who may not be able to easily describe how clearly they see. Where possible though, the optometrist will work with you, to fine tune the results by asking you to read letters on a test chart, through different strength lenses and to make comparisons of one lens versus another. Initially, each eye will be assessed individually and finally, both will be tested together. Intraocular (internal eye) Pressure – this is assessed to measure the pressure inside your eyes. It is usually measured by puffing a small amount of air on to the front of the eye, using a non-contact tonometer. The instrument works by judging the speed of rebound of the air from the eye. It does not hurt to have this test done— it just simply causes the eye to blink. This is an important test as high pressure could put the eye at risk of developing glaucoma. There is also a contact method of tonometry which may be required if the ‘air-puff’ readings are high. Visual field screening – this checks that your all-round, peripheral vision is working well and fully sensitive to changes of light levels. It can detect glaucoma or other neurological conditions such as mini-strokes, which affect the optic nerve or the visual area of the brain. The test involves watching a light in the centre of a grey screen, and being aware of when another light flashes briefly on and off, somewhere else on the screen. You may be required to click a button each time you see a light. or to say how many lights came on at once. Visual field screening ensures that “the eye and the brain are talking to each other”. All drivers are legally required to have a wide visual field.